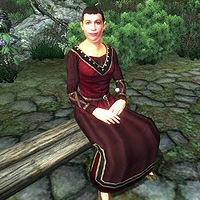 Javolia Maborel is an Imperial commoner who is a devout worshipper of the Daedric prince Meridia, and can be found with her fellow worshippers Basil Ernarde and Demetrius at Meridia's Shrine. She will never break her vigil of Meridia's Shrine and will spend day and night worshipping at the shrine. She prefers to sit on one of the benches, listening to the sermons performed by Demetrius from behind the lectern. At other times, she will get up and wander aimlessly around. Javolia wears middle class attire, specifically a burgundy linen shirt, a pair of burgundy linens, and russet felt shoes. In combat she relies on her iron dagger. When you speak to her she will say, "Life is a blessing, and death is not the end, but only when the spirit remains incorruptible." She will then immediately end the conversation.